Last night on American Idol, all of the singers chose songs that were inspirational to them and that they would call their "life anthem." As the show was going on, I started thinking about what my song would be if I were on the show. (I hear you smirking, no I don't have delusions that I would be on the show....) I was running it through my mind and trying to come up with something that really had meaning to me, and wasn't just a "nice thought." I finally came up with it. I think I would use the song "Stand" by Donnie McClurkin. That song is so powerful! I remember watching him sing it on tv after 9/11, and feeling all of the emotion come right through the screen. Now, I'm usually not much of a cryer. In fact, I'm pretty good at "choking 'em back," but I even think a couple of tears might have squirted out that day. Anyway, before I could even mention to Anne what I was thinking about, she said, "Someone should have sung Stand by Donnie McClurkin." I couldn't believe it! We had a genuine "old-married-couple-mind-meld!" I think it might have been a milestone in our relationship. Okay, back to the song. It's based on Ephesians 6:11-18 which talks about putting on the full armor of God so that you may be able to stand your ground. It's so important in this day and age to recognize that we are in a spiritual war. A war against the "devil's schemes" as verse 11 puts it. I think the "devil's schemes" come at us in various ways. In our mind, he lies to us and tells us that we're not good enough to be a Christian, or that we can never make a difference. Or he attacks from the outside, maybe it's through that family member who continually ridicules you because of your faith. Either way, when we allow the armor of God to be our protection, we can see through these lies for what they really are. Then, as we take up the sword of the Spirit, we can walk in confidence that God's promises are true. My mom has had two bouts with breast cancer. The most recent bout was last year. One day, as I was walking into my parent's house I saw a sticky note posted on their refrigerator that summed up her feelings on the whole matter. It said, "Devil, get ready for a fight!" I loved that! She had decided that she wasn't going to listen to the lies that the devil was putting into her head, and was taking up the sword of the Spirit to fight and claim God's promise that she was healed. In a word, she's was going to Stand. Sometimes, after we've done all that we know how to do, that's all that is left. Ephesians 6:13 says, "and after you have done everything, to stand." Today I decided to go public! I went through all of my email contacts and sent emails to about seventy friends who I have known through the years. If you are viewing my blog for the first time, I want to say welcome! I have only written eighteen posts, so it should be pretty easy to catch up. Please leave a comment and let me know you were here! This weekend was focused on spending time with my family. On Thursday, I got to spend some quality time with my daughter Morgan. She had a field trip to Universal Studios in Orlando, and I was able to accompany her. We went on some rides that I think she would definitely have skipped if it weren't for all of her classmates that were with us. Even I questioned whether some of these rides were appropriate for 3rd graders. But, I think she has survived the trauma from the "Revenge of the Mummy" ride and the "Horror Make Up Show." She told me she likes the Disney parks better. She says they're better for kids. I think she's right. After the piercings, we had dinner with my parents to celebrate my dad's 69th birthday! Sorry dad, was I not supposed to mention your age? Actually, when I tell people my dad's age, they are usually surprised. He is still active, pastoring Faith Assembly in St. Pete and making a difference in numerous families lives each week. On Sunday afternoon, Anne's family came over. We always have a good time with her parents, brother and his family. The kids had a blast in the pool, the ladies played cards, and the guys watched hockey. Pretty good way to spend a day if you ask me. It's so great to be able to share these moments together. I am blessed to be a part of a family that I love, and loves each other. Proverb 3:5,6 says "Trust in the Lord with all your heart and lean not on your own understanding; in all your ways acknowledge him, and he will make your paths straight." What does it mean to truly trust in God? Some definitions of the word "trust" include, "to have confidence or faith in", and "certainty based on past experience." We know that God is the same yesterday, today, and forever (Hebrews 13:8), and we have seen His faithfulness throughout the bible and in our lives. Surely, based on past experience, we know that God is trustworthy. But what is our first response to adversity? Is it faith and confidence, or fear and worry? If the answer is fear and worry, it's probably because we are continually trying to figure things out on our own, instead of relying on God. If we can recognize that He is working everything for our good (Romans 8:28), and then learn to truly trust in Him with all of our heart, we will save ourselves a lot of unnecessary worry. As I was driving today, the dell dj started grooving to some great tunes by a musician that most of you have probably never heard before. His name is Charlie Hunter. He plays an 8-string guitar, and usually plays both the bass and chords while he solos as well!!! It's pretty incredible what he can do, not to mention how funky it is! Some of my favorites include the albums "Natty Dread", "Ready, Set, Shango" and "Duo." Check it out! Have you listened to any good music lately? Leave a comment and let me know. In my last tech post I talked about the differences between Macs and PCs. But, with all of the differences in operating systems, I am increasingly becoming a fan of web based applications like those that are offered by Google. In fact, some people think that there will be a day when the operating system itself will be irrelevant as more and more applications are housed on the world wide web. (Read this for more info on the WebOS.) I know this post is going to sound like one big advertisement for Google, but I have been using their products for a while now, and am excited about the value they offer. As long as you can get onto an internet-connected computer, you can access all of your programs. I have moved all of my email accounts to gmail. The benefit to this is that it doesn't matter if I switch internet service providers, my email remains the same. At first I was concerned that web mail was not going to be fast enough for me, but after using it for a year, I don't have any complaints about lag time. Also, with the gmail notifier on my desktop, I know when I have mail even when I'm not looking at my email account. I have also started using Google's docs and spreadsheets. This way, whether I am using my laptop or my mac at home, I always have access to documents that I am working on, and they are always updated to the latest versions. With Google calendar, I am able see my schedule, as well as my wife's, in one place. Okay, enough of this fanboy stuff. I just wanted to write this for those who may not have ventured out and tried some of these new applications, maybe you'll find something you like. And, if you'd like even more info, you can read this interview from Wired magazine with Google CEO Eric Schmidt, and this post from Tony Morgan about how some of Google's ideas can apply to ministry. In Numbers chapter 13 the Israelites were on the verge of entering the promised land, Canaan. They had already seen God's hand many times. God had parted the red sea so that they could escape the Egyptians. His presence guided them with a cloud by day, and a fire by night. They were hungry, and God provided quail and manna for them to eat. By the time they reached Canaan, you would have thought that their faith was so strong that they would be ready to overcome any obstacle. Before they entered the land, Moses sent a group of twelve to go and explore it. Their mission was not to determine whether or not to go into the land. God had already promised that the land was theirs. The twelve men spied on the land for forty days. When they came back and gave their report, they said, "The land is full of milk and honey, but." They went on to say how there were huge people, and fortified cities, and there was no way that they would be successful in taking the land. Only two of the men, Joshua and Caleb, said that they could certainly do it. The majority of the spies spread the bad report among the Israelites. The result of their lack of faith, was that God caused them to wander in the wilderness for forty years, and none of that generation was able to enter into Canaan, with the exception of Joshua and Caleb. The interesting point in this whole story is that the "bad" report that was being spread was not a "false" report. It was true that there were fortified cities and huge people who lived in the region. But they failed to remember that God had already promised that He would be with them. He had shown that He kept His word through all of the miracles that had been done in the past. The spies couldn't see the problem through God's eyes, they were only seeing it in their own strength. No, they couldn't win the battle on their own, but God would ensure that the land would be theirs. It's easy to condemn the ten spies and say, "How could they have forgotten about all that God had brought them through?" But, if you think about it, don't all of us get nervous when we think the problem is bigger than we are? I think that it's easy to look at obstacles that come our way, and turn away because we think it's impossible to overcome them. Yet 1 John 5:4 says that "everyone born of God overcomes the world." If God could deliver the Israelites out of the land of Egypt, and into the promised land, then he can meet your need today as well! The question is, whose report will you believe? Since I'm a technology buff, I always have people asking me the question, "Which is better, Mac or PC?" Most people expect that I'm going to say how much I love Macs and how Windows is just terrible in comparison to the ease of use and simplicity of the the Macintosh operating system, OSX. The truth is that I fall somewhere in the middle of being an Apple fan, and appreciating the benefits of Windows as well. Let me explain. While I do know quite a bit about computers, I am not a programmer or someone who likes to dive into the inner workings of every program that I use. Mostly, I just want it to be simple to figure out, and even more important, I like it to work. So, the Mac seemed like just the thing that I was looking for. I had purchased some Macs for some staff members who used them primarily for video editing and graphics creation and they raved about them. So, I bought my first Mac 3 years ago. Once I got started with it, I have to admit that I became disillusioned pretty quickly. Since I had been told over and over that Macs were so much easier and simpler to use than PC's, I guess I had my hopes up pretty high. As it turned out, I didn't find it any easier to set up and use than any PC I had ever been on. And then I was having to learn a whole new system of organization of files and programs that didn't really seem any simpler than the other system, just different. I suppose if I was using my Mac to edit videos or create graphics, I would have realized the benefits of it fairly quickly. I think there are definite hardware and software advantages in the Mac if these are your primary uses. However, I have come to realize that the benefits of having a computer that's good at editing videos doesn't help you if you never use it to edit videos. :) I had also been sold on Apple's iLife suite of applications. But, with the advent of subscription based music services (click here for my post on those), I was frustrated because iTunes doesn't offer it, and no subscription services work on a Mac. Also, iPhoto is an excellent application for organizing photos, but I have been using Picasa on my PC and find that I like it better, and it's a FREE download from Google. The other frustration that I've had with the Mac is that there are websites that simply won't work with it. Now, to be fair, this is really the fault of the site owners, but to me I just want it to work! If I want to pay for my kid's school lunches on the web, I can't do it on the Mac. And this doesn't even include the many programs that I've thought about purchasing, but aren't compatible with the mac. So, my answer as to which is better is a complicated one. I usually recommend a PC to users who are not "power" users and will primarily be surfing the web, organizing photos and music, and creating simple documents. For those who are more serious about video, or just want to be among the Apple elite, you will probably love the Mac. I'm sure there are Mac lovers out there who will think that this post amounts to heresy, but I'm just giving you my experience. Feel free to tell me yours. Today was a great Easter! It started with a great service at church. This weekend our church had a record attendance of more than 6500!! Then, our family went over to my wife's parents house for dinner, decorating easter eggs, and an Easter egg hunt with the cousins. With seven children under the age of nine between our families, we always have a great time, even if it is a little wild sometimes. This year I was chosen to assist in the specialty egg decoration. The kit that we bought was called tie dye easter eggs. The great thing about it is that it's very difficult to mess up. 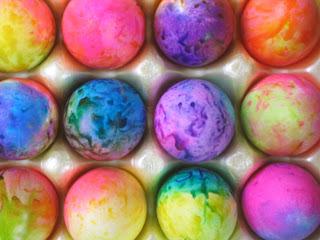 The kids selected their colors and I assisted them in slathering the color around on the egg to create some kind of creation. I think they turned out kind of cool, so I included a picture for you to admire my craftiness. :) Another big highlight for Easter this year was that my daughter wanted to share the Easter story with the family. Yesterday, she looked up the story in the bible, and then typed it on the computer so that she could read it to everyone. I am so glad that she is learning the true meaning of this holiday. As I listened to her read, I thought about how blessed we are to have a family that loves God and loves each other. I pray that as all of our children grow up, that they will remember these times and understand that God's love is the common bond that we all share. Hebrews 12:1-4 (NLT) "Therefore, since we are surrounded by such a huge crowd of witnesses to the life of faith, let us strip off every weight that slows us down, especially the sin that so easily hinders our progress. And let us run with endurance the race that God has set before us. We do this by keeping our eyes on Jesus, on whom our faith depends from start to finish. He was willing to die a shameful death on the cross because of the joy he knew would be his afterward. Now he is seated in the place of highest honor beside God's throne in heaven. Think about all he endured when sinful people did such terrible things to him, so that you don't become weary and give up. After all, you have not yet given your lives in your struggle against sin." When I was growing up, it seemed that most of the world around me viewed things from a Christian perspective. It was fairly well understood that biblical principles were the foundation of morality, and that anything outside of those boundaries was considered a fringe idea. As we approach Easter in 2007, it seems that America is in a very different place. More and more, the teachings of Christ and the morality of the bible is being attacked as antiquated and "just one of the many" acceptable lifestyles. It's easy to feel defeated as we see Christianity mocked in the media. But, I love how this scripture sums up so beautifully what our response should be. God has given us the strength to run the race. We will have endurance when we focus on Jesus, the one on whom our faith depends! Our battle is not lost! There are so many around us who need to hear that God loves them in spite of their mistakes. Jesus was willing to die for us because he knew the JOY that would be the result! How could we think about giving up, or not going the extra mile to share our faith? We have the greatest news to share that the world has ever heard. Don't be discouraged by the culture that surrounds us, but focus on Christ and continue to share the miracle of His resurrection. Go to church this weekend and encourage others to do the same!